Charles Colson tackles the deceptions of contemporary society in LIES THAT GO UNCHALLENGED IN POPULAR CULTURE. Using sound biblical truth and concise examples of individual situations, Colson helps us uncover and dispel the lies proclaimed in today's popular culture. Readers gain a full understanding of underlying motives, events, and repercussions of the lies our culture is feeding us. "No one has a monopoly on truth." "You can be who you want and do what you want." Truths? Lies? Somewhere in between? These and other statements float through our society - on television and radio, in print media, political speeches, and classrooms. Often these assertions are left unchallenged because they sound good on the surface, yet they embody ideals that fundamentally oppose truth. How can we understand and respond to worldviews that appear to embrace acceptance, tolerance, and peace, but in fact threaten to drown out the truth about our society? 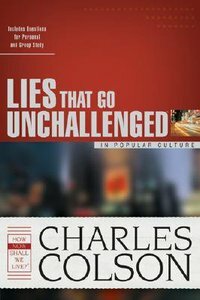 In LIES THAT GO UNCHALLENGED IN POPULAR CULTURE, Charles Colson examines seven lies that affect our contemporary society, and he brings clarity to various events and trends over the past decade. Useful for individual or group study, Charles Colson's insightful observations and practical applications will help you answer effectively widely accepted misconceptions in popular culture. About "Lies That Go Unchallenged in Popular Culture"